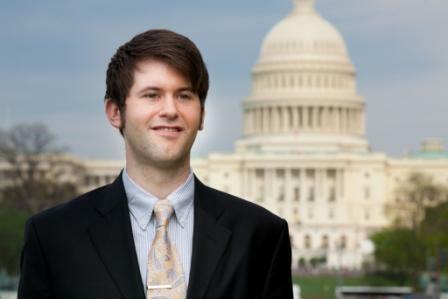 Marc Langston (’11) was a high school junior when he first visited Wake Forest University. He was among a group of students from Wichita, Kan., on campus for a debate camp. As a college undergraduate, Langston remained home and earned his bachelor’s degree at the University of Kansas in Lawrence. But when it came time to pursue a law degree, there was little room for argument. He was going to Wake Forest. In Washington, Langston worked in the Office of the General Counsel for the National Nuclear Security Administration, which, according to its website, is responsible for the management and security of the nation’s nuclear weapons, nuclear nonproliferation and naval reactor programs. NNSA also responds to nuclear and radiological emergencies in the United States and abroad. Langston was working with the administration when the catastrophic earthquake and ensuing tsunami struck Japan on March 11. The administration deployed 33 people and more than 17,200 pounds of equipment to the region. While at the NNSA, Langston had the opportunity to work with David Jonas (’81), general counsel for the NNSA. “Many schools have great alumni, but none like Wake Forest,” Langston said. “I was given an opportunity through our alumni contacts to work at amazing agency … performing legal work where the contracts are not about just simply money between two countries but hundreds of millions of dollars of nuclear nonproliferation. The issues are fascinating, and Wake’s alumni network provided me with the opportunity to tackle things that I’ve only dreamed about and things that I studied in high school debate at Wake Forest,” said Langston, who has visited the United Nations in Geneva and studied international human rights in Italy. While in Washington, Langston attended a reception with U.S. Supreme Court Justice Ruth Bader Ginsburg, had breakfast with the Secretary of Energy and ate dinner with the Turkish ambassador. Langston serves on board of directors for U.S. Senate Youth Alumni Association, an official youth program of the Senate. During his time in the capital Langston honored former Sen. Bob Dole with the Rosalie Wynn Hearst Distinguished Public Service Award. Former Sen. Elizabeth Dole (R – N.C.), accepted the award on her husband’s behalf. Langston referred to the former senator from Kansas as a hero and mentor. “His type of politics is uncommon,” he told the University Daily Kansan. No doubt, Langston is, and will always be, a Jayhawk. He will also forever be a Demon Deacon. On this point there can be no debate.